in the Blessings Box dedication service. “For I was hungry and you gave me food, I was thirsty and you gave me something to drink, I was a stranger and you welcomed me” (Matthew 25:35, NIV). Earlier this year, we held a service of commissioning as part of our Sunday worship service, and since then, the box has taken on a life and ministry of its own. We’ve learned that there is a tremendous need for these items here in our community. People are taking and sharing virtually every day. As a result of the box being available 24/7, we’ve also noticed a decrease in the number of people calling to ask for financial assistance. The best way for us to partner with area food banks is to focus more on the non-food items. Food banks do not provide diapers, detergent, and hygiene products. Additionally, since food stamps cannot be used for diapers, they have been most requested and taken from our Blessing Box. A parent cannot take her children to daycare if she doesn’t have diapers, and diapers cannot be bought without going to work for income. It’s a real catch-22 for some families! We have also discovered the need for food dramatically increases when the schools are closed. Children who receive lunch assistance really suffer when school is not in session, and we’ve seen that translate into a greater demand for food items during that time. And we’ve reaffirmed that we are part of an incredibly generous community both inside and outside the church. Several area dentists have supplied toothbrushes, toothpaste and floss. Several individuals, including families from our Kid’s Club and scouting programs, have committed to making weekly and monthly contributions to the box. Even local businesses have joined in by hosting “diaper drives.” Folks who want to participate but cannot make financial contributions are invited to stop in and create “diaper packs”—repackaged bags of six. We have a cabinet in the church set up to store the packs so that the box can easily be restocked as needed. We also have those who pray regularly for this ministry and for all those who participate that all who give and all who receive will be blessed. To say the least, the Blessings Box has been transformative for all who have given to and received from this ministry. Our church learned more about what it means to feed the hungry, offer water to the thirsty, welcome the stranger, and work for God’s will “on earth as it is in heaven.” We hope that you will be encouraged and inspired by our story. 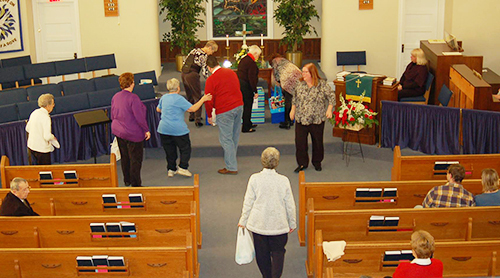 The Nokesville Church of the Brethren exhibits what it means to be a vital congregation of the Church of the Brethren. Their discernment process around the Lord’s prayer has empowered them to be “creatively intentional in outreach to new people” and to be an “instrument of God’s Kingdom.” What vision may God have for your community? The Vital Ministry Journey could help your congregation explore this question. 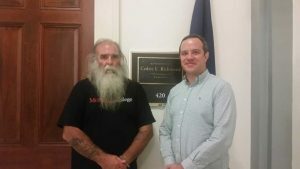 The Office of Public Witness has been meeting with U.S. government agencies to advocate for the use of Unarmed Civilian Protection (UCP). Christian Peacemaker Teams (CPT) is one organization that uses UCP methods to nonviolently work towards justice. In this guest blog post, Tim Heishman reflects on his experience with a CPT delegation. This past August I was privileged to take part in Christian Peacemaker Teams’ Indigenous Peoples Solidarity Delegation to Manitoba and Ontario with my wife Katie. Christian Peacemaker Teams is an organization founded by the historic peace churches and based on the notion that Christians should be as willing to put their lives on the line for peace as soldiers are for war. During my time on the CPT delegation I heard many stories about the effectiveness of unarmed civilian protection and peaceful efforts to bring about solutions to injustice. We learned about the story of the Shoal Lake 40 indigenous community in western Ontario. About 100 years ago the city of Winnipeg decided to build an aqueduct from the lake next to the indigenous community to carry water to the city. The problem was that the lake was split during construction, half of it was then contaminated, and half of it was clean. The clean water was reserved for the city of Winnipeg and the contaminated water was left for the indigenous tribe. Contaminated water is a huge problem for indigenous people because so much of their life and culture revolves around water. For example, the fish that made up a significant part of their diet now made them very sick. The way the city of Winnipeg divided the water when constructing the aqueduct also cut the community off from the rest of the world. They could get out during the summer by boat and in the winter by driving across the ice, but in the fall and spring they were stuck. Fast forward nearly 100 years and Winnipeg built the Canadian Museum for Human Rights. A successful campaign organized by indigenous leaders and settler allies highlighted the fact that the human rights museum was getting its water by oppressing an indigenous tribe. It was a bit of an embarrassing public relations issue, to say the least! The organizers even came up with their own Museum of Canadian Human Rights Violations! A peaceful campaign worked to call out and transform structural violence committed by the city of Winnipeg over a period of 100 years. We met with leaders from the Grassy Narrows indigenous tribe in Ontario and they told us the story of how they successfully organized a blockade to stop illegal logging by corporations on their land. It began when a teenager cut down a tree to block the road so the logging trucks could not get through and complete their work. Soon others from the tribe joined in and a protest camp was established next to the road. Christian Peacemaker Team members joined to stand in solidarity with the tribe. For four months, from December to March, indigenous and settler allies stood together to stop illegal logging on indigenous land. They were ready to stand peacefully against the violence of the corporations and the state. The corporation eventually decided to do their logging in another place and for now the tribe has been successful in peacefully defending their right to the land that belongs to them. Christian Peacemaker Teams does work like this all over the world. They believe that Christians should put as much energy into working for peace as militaries do for war. Working against injustices and violence with peaceful methods allows us to retain the moral high ground and expose the injustices of the perpetrator in a way that a violent response would not. Sometimes violence is physical and other times it is structural. It can be stopped with unarmed civilian protection. Sometimes governments and militaries choose to lay down their weapons and protect a place peacefully. The peninsula on which Common Ground is located is one such place. Common Ground is located in Kenora, Ontario. Many years ago several indigenous tribes and settlers fought over this piece of land. The opposing sides came together, they decided to hold it mutually, and they called it Common Ground. Today it is surrounded by several miles of beautiful hiking trails and it is still a place where all people can come together and enjoy the beauty of God’s creation. May all people come together to embrace God’s call to model our lives after the Prince of Peace and settle our conflicts nonviolently. “Aiki! Aik! Aiki!” men called out from time to time, “Work! work! work! (in Hausa). 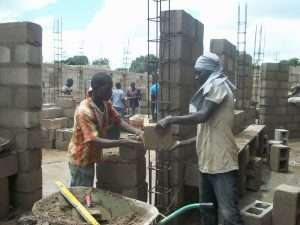 Under a hot sun, a continuous line of men carried cement blocks up a wooden ramp with nailed on rungs, to the second floor of what will be a new office building for the EYN (Church of the Brethren in Nigeria) staff, at the church headquarters in Kwarhi, in Adamawa State. On the second floor, groups of men mixed up mortar, and lay block to form the walls and doorways of the new building. This was the first week of a two-week workcamp (August 17-September 3) co-sponsored by EYN and the Church of the Brethren. 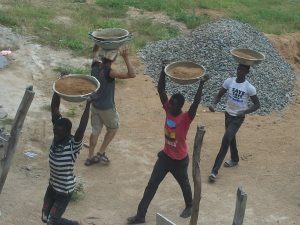 About 17-20 Nigerian men came each week from churches to help with the building. Three of us, Johnathan Ogburn, Dana McNeil, and Peggy Gish, representing the Church of the Brethren in the U.S., joined in and were warmly welcomed. The construction of this building was started in 2014, before Boko Haram looted and damaged the staff buildings. Because the EYN staff and other people from the area fled and temporarily based its headquarters in Jos, the construction stopped. This is the second workcamp to work on this building since the EYN staff returned in 2016. The camaraderie and festive mood of the group attracted a number of boys and girls—children of EYN staff and others living near the compound—who joined in the work. They filled metal dishpans with sand and carrying them up to the second floor to be mixed with concrete. Two of the older boys proudly found that they could carry on their heads or shoulders half blocks. There would be moments, however, when the children or adults erupted into play. Suddenly the children would be flying paper airplanes around the site or playing impromptu games. As the time went on, there were more playful moments among the men—joking around, working to music, or tossing plastic water bags to or at each other that burst. During a break young men spontaneously formed a percussion band and sang together. Another time the words in Hausa to “Holy, holy, holy” or “Count Your Blessings” could be heard through the building as they worked. 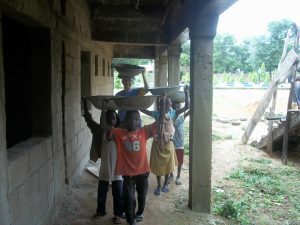 Long after the participants go home, we expect the impact of this workcamp to extend beyond the almost 5,000 cement blocks that had been trucked in and mortared in place. Forged together in these two weeks will be the ongoing friendships across tribes and cultures, and increased dedication to and joy of serving their church. The work here will not only strengthen EYN as a church, but stand as a symbol of hope—as out of the crisis it rebuilds and is renewed. Nathan Hosler leading an Insight Session at the 2017 Annual Conference. If all politics were controversial before, they have gotten even only more so in the past year. 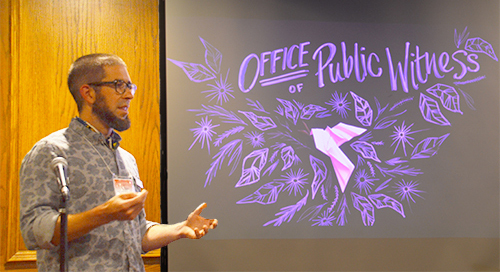 We may ask, “How do we advocate—engage in policy debates with our distinctive voice—when our own body also experiences many divisions?” The Office of Public Witness as a ministry of the Church of the Brethren is guided by Annual Conference decisions. While these decisions are never unanimous, they do represent important markers of collective discernment. In the last few years, Joshua Brockway, director of Spiritual Life and Discipleship, and I have been doing joint workshops at Annual Conference. In these discussions, we have worked alongside one another as an experiment in spiritual discernment and public witness. While public witness is often thought to trade in certainties and strategy and attempts to bring change, spiritual life and discipleship are typically seen as contemplative, personal, and private. While these generalizations may be somewhat accurate, it is our hope that our witness be built in discernment and theological reflection, and that our spiritual life outwardly reveals the peace of Christ. As Brethren, we remain committed to following the way of Jesus and serving those in need. As a child and young adult, I was quite familiar with service: workcamps, work days at our local camp, making apple dumplings to sell at the disaster auction, and a number of other opportunities. I also learned that following Jesus meant being against war and for peace. 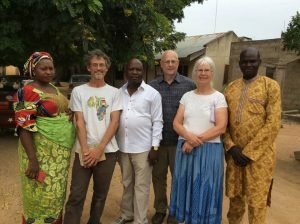 In college and then serving with Ekklesiyar Yan’uwa a Nigeria, I grew to understand that service and peacemaking are both local and individual, but also at many other levels of communal and global living. I now call these acts of faith done in the world “public witness.” The desire to serve and work for peace is part of our shared worship, prayer, and Bible study, and is both local and global. The Office of Public Witness is not the denomination’s group of little politicians but simply an extension of the work of service and peace that can be found throughout the Church of the Brethren in the United States and around the world. We pray that you will be blessed as you connect faith and public witness in your own life and community. Thank you for partnering in this important work and for supporting the Office of Public Witness. Learn more about the Office of Public Witness at www.brethren.org/publicwitness. Support this and other ministries of the Church of the Brethren at www.brethren.org/give . North Korea has been in the news over the past few weeks as tense rhetoric between the U.S. and the North Korean government escalates. North Korea continues to build its nuclear arsenal and test long-range missiles- even going as far as to fire a missile over the nation of Japan, and claiming to have successfully tested a hydrogen bomb this past week. President Trump threatened “fire and fury” in a speech on the conflict, and U.S. policy towards potential military action on the peninsula continues to be unclear to both citizens and our international allies. In addition to the people of South Korea, there are over 25 million people in North Korea who would be impacted by military action- not to mention the 28,000 American soldiers stationed on the peninsula. We continue to support this approach, and believe that the current tense rhetoric is incredibly detrimental to the peace process. As we work towards human rights, nuclear disarmament, and international peace, we need national governments to speak with clarity, sincerity, and peaceful intentions. The United States, as a global leader, has the power to reframe conflict narratives by swallowing its pride and making the first moves towards peace. As John Delury wrote in a recent Foreign Affairs article, “Incessant talk of war only serves to reinforce North Korea’s worst narrative about America’s implacable hostility.” We encourage the U.S. national leadership to consider how they can actively work towards de-escalation and the normalization of relations with North Korea. 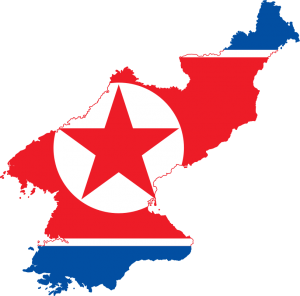 The Church of the Brethren Office of Public Witness will continue to monitor the situation in North Korea, and we will seek to advocate for a peaceful resolution to the tensions that have plagued the U.S. – North Korea relationship for far too long. The following guest blog post was written by Erick, a DACA recipient who has been active in the life of the Church of the Brethren. An announcement regarding the future of the DACA program is expected to be made on Tuesday, Sept. 5th. Update, 9/5/17 11:27am: The DACA program has been rescinded, leaving a 6 month window for Congress to pass legislation like the DREAM Act of 2017 to protect DACA recipients. Hello, my name is Erick. I have formed part of the Church of the Brethren denomination since I was around 8 years. I am now 26 years old, and going strong. The brothers and sisters of The Church of the Brethren have formed a vital part of my identity as a Christian. I have been involved with my congregation, Principe de Paz in Santa Ana. Formerly, I was the secretary for my congregation for about six years. I have also been a part of our worship group playing the bass for about seven years. I have also been a part of the Young Adult Policy Board for about two years in the Pacific Southwest District. I graduated and earned a Bachelor of Science degree in Biochemistry in 2016. I am currently a first-year pharmacy student to earn my doctor of pharmacy degree at a university in Nashville, Tennessee. This is just a little background about myself. Have you heard of the current news regarding Deferred Action for Childhood Arrivals (DACA)? President Trump is being pressured into making a decision by this week on whether the DACA program remains, or not. This decision will affect more than 800,000 students and individuals like me. Like many individuals under the DACA program, I was brought to this country at an early age, at the age of 2. I do not remember anything from my country of origin. I view myself as an American; I have embraced the American culture. I want to form a permanent relationship with this country. Some Americans argue that people like us broke the law, and we must be punished by being deported. Some Americans view us as criminals, when all we want to do is fight for our freedom, and live the American dream that many of their ancestors fought for in previous generations. Some argue that we should go through the legal route. Current laws prohibit us from gaining any sort of legal path to citizenship. I am an individual that pays his taxes. I have paid for my college education myself, because we don’t have the same privileges as American Citizens. It saddens me that people like me have to prove our humanity. The American Culture is ingrained in me like any other American Citizen. I embrace my identity. All we ask is for an opportunity. All current individuals under the DACA program are expected to maintain a clean record in this country. DACA gives us the ability to work legally and obtain a State Driver’s license. It also allows us to continue pursuing higher education. It also means that we cannot leave the country, unless if for humanitarian or work-related reasons. I ask you to please stand with the DACA program. Please support us. Some of us are teachers, policemen, firefighters, lawyers, etc. We are all hoping to finally obtain the American dream that many of your ancestors worked so hard to obtain. I am not going to lie and say I am not scared, because I am. Ending the DACA program has many negative implications for individuals like me. I want to continue studying to become a pharmacist. I want to impact my community in a positive manner by being a healthcare provider. I want to be a part of the change, and contribute to society. I long to be a part of this country, which is the only country I have truly known at a personal level. Ending this program might mean I may not be able to finish my studies. However, as a believer of Jesus Christ, I have maintained faith and peace. I do not hold any animosity against anyone that does not support the DACA program. I only ask them to learn more about individuals under the DACA program so that they may understand what we are going through, and maybe empathize with our situation. We are all moving forward in hopes to form a legal, and permanent place in this country, God bless America.